Bronze Age Britain 2500 - 1000 B.C. Two of our current sites had excavations carried out 30 years ago by the musueum that found several Beaker people graves, here is some more information on who they were. See also the Field Survey Report we commissioned on one of the sites that highlighted a huge Bronze Age settlement. Beaker People. About 2500 B.C. an influx of migrants settled in England. These newcomers have been called the Beaker People because of the shape of the pottery vessels which are so often found in their round barrow graves. The stocky newcomers, although few at first, seem to have quickly gotten the upper hand on their Neolithic landlords, becoming a sort of nouveau aristocracy. The Beaker folk were farmers and archers, wearing stone wrist guards to protect their arms from the sting of the bowstring. They were also the first metalsmiths in England, working first in copper and gold, and later in the bronze which has given its name to this era. There was a changeover during this period to round houses, echoed in the mushroom-like growth of stone circles and round barrow mounds. We can guess that huts had a low stone wall for a base which was used to brace wooden poles and rafters. On top of this would have been a roof of thatch, turf, or hides. 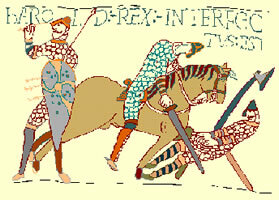 They made their own pottery, and eventually the first woven garments in Britain .They also seem to have introduced the first alcoholic drink into Britain, a form of honey-based mead. The islands have never been the same since. The Beaker Folk introduced a pastoral pattern to the agricultural lifestyle of Neolithic times, putting pressure on their predecessors for land as they grazed their flocks over wider and wider areas of England. They were a patriarchal society, and warlike. It is during the Bronze Age that the individual warrior-chief or king gained importance, contrasting with the community orientation of the Neolithic times. Where Neolithic man favoured communal burials the beaker people buried their dead curled into the foetal position in individual stone lined graves or cists which occasionally had cairns built over them. With the body they placed personal possessions; jet buttons and necklaces, bronze daggers and armlets, earthenware beakers or ceremonial drinking vessels, and later in the age a food vessel containing grain was often included. Many of these cups or "food vessels" were inscribed with spirals or "cup and ring" markings, which presumably had some religious significance. We've already mentioned the round barrows. They were often clustered in groups which suggest family cemeteries, sometimes very close to earlier Neolithic henges and monuments, as if taking advantage of sites already felt to be sacred. 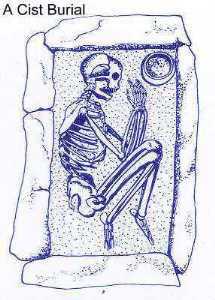 The barrow graves were generally filled with grave goods, indicating the importance of the dead person and a belief in some kind of afterlife. Some of the goods included in barrows were: pottery jars, golden buckles, bronze daggers, cups, necklaces, and sceptres in various stones and precious materials. The other main area of Bronze Age focus was stone circles. Although circles may have been erected as early as 3400 B.C., the major circle building era was during the Bronze Age. This suggests that The Beaker Folk and their descendants took over or adopted many of the beliefs and customs of the earlier Neolithic inhabitants. Certainly they had a go at improving the most famous of all stone circles, Stonehenge. Burial mound, usually composed of earth but sometimes of stones. Examples are found in many parts of the world. The two main types are long, dating from the Neolithic period (New Stone Age), and round, dating from the Mesolithic period (early Bronze Age). Barrows made entirely of stones are known as cairns. Long barrows may be mere mounds, typically higher and wider at one end. They usually contain a chamber of wood or stone slabs, or a turf-lined cavity, in which the body or bodies of the deceased were placed. Secondary chambers may be added in the sides of the mound. They are common in southern England from Sussex to Dorset. Earthen (or unchambered) long barrows belong to the early and middle Neolithic, whereas others, such as the Neolithic West Kennet barrow near Avebury, Wiltshire, were constructed over megalithic (great stone) tombs which generally served as collective burial chambers. The stones are arranged to form one, often large, chamber with a single entrance, and are buried under a mound of earth. The remains of these stone chambers, once their earth covering has disappeared, are known as dolmens, and in Wales as cromlechs. Round barrows belong mainly to the Bronze Age, although in historic times there are examples from the Roman period, and some of the Saxon and most of the Danish invaders were barrow-builders. In northern Europe, round barrows were sometimes built above a tree-trunk coffin in which waterlogged conditions have preserved nonskeletal material, such as those found in Denmark dating from around 1000 BC. In Britain the most common type is the bell barrow, consisting of a circular mound enclosed by a ditch and an outside bank of earth. Other types include the bowl barrow, pond barrow, saucer barrow, ring barrow, and disc barrow, all of which are associated with the Wessex culture (early Bronze Age culture of southern England dating from approximately 2000–1500 BC). Many barrows dot the Wiltshire Downs in England. Barrows from the Roman era, such as the Six Hills at Stevenage, Hertfordshire, and the Bartlow Hills at Ashdon, Essex, have a distinctive steep and conical outline, and in southeast Britain usually cover the graves of wealthy merchant traders. They are also found in Belgic Gaul, where the traders had commercial links. Not all burials in the Roman era were in barrows; cemeteries were also used. The Saxons buried the remains of important chieftains in large conical barrows, such as Taeppa’s law which gives its name to Taplow, Buckinghamshire, but clusters of small burial mounds are more commonly found. Many examples of these graves of ordinary people are found in east Kent. In eastern European and Asiatic areas where mobility was afforded by the horse and wagon, a new culture developed of pit graves marked by a kurgan, or round mound, in which a single body lay, often accompanied by grave goods which might include a wagon. These date from around 3000 BC. The placing of a great person’s body in a ship is seen in Viking burials, such as the Oseberg ship in Norway, which was buried and sealed around AD 800. Barrows were erected over boat burials during the Saxon period, and the Sutton Hoo boat burial excavated in Suffolk during 1938–39 was that of an East Anglian king of Saxon times.